Perfectly Perrywinkle: Patriot Golf Day! Over the last few years, I have found an incredible sense of enjoyment working with different charity foundations through golf. One foundation in particular has really struck a chord in my heart. The Folds of Honor Foundation is a non-profit organization that provides post-secondary educational scholarships for the children and spouses of military men and women disabled or killed serving our great nation. Take a minute and watch this announcement for a call to action by President George W. Bush this coming Labor Day Weekend! Three summers ago, my husband and I met Major Dan Rooney who started "Patriot Golf Day" which raises money for the Folds of Honor. I was invited to participate in the Inaugural Patriot Cup in Tulsa, Oklahoma which was a life changing experience! Since then, I have felt compelled to help raise the awareness of this wonderful cause. There is no way possible to even put down in words the heart-touching stories and wonderful life changing events that I have heard and witnessed in the past few years. Unexpectedly losing my own dad just a couple months ago, brings this cause even closer to my heart. I hope to one day be able to use my golf as a launching pad for incredible foundations such as Folds of Honor Foundation, to help give children every opportunity that I was afforded growing up in both education and in golf. 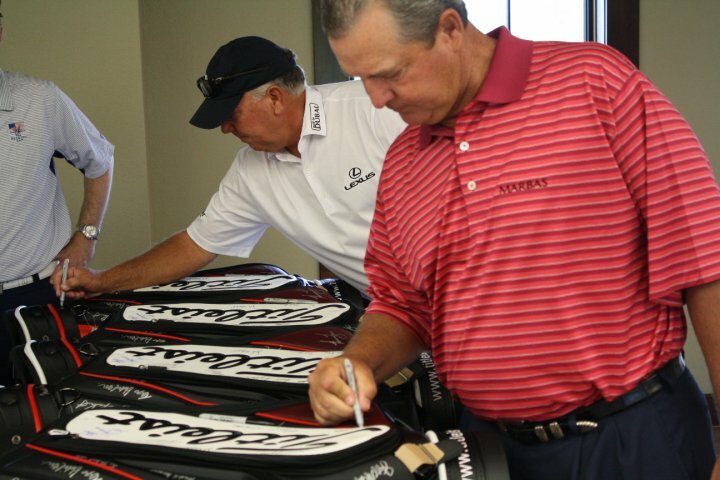 Tom Purtzer and Mark O'Meara signing memorabilia to be auctioned off at the Black Tie Gala later that evening! On the 18th hole after a wonderful day of golf, each celebrity and pro received a very special gift from a service member! Our very own custom-to-size, official F-16 Fighter Pilot Jacket with our name stitched onto the left chest and Folds of Honor Crest mounted on the right! These jackets are only made for US F-16 Fighter Pilots and something money cannot buy! I couldn't believe they had secretly called my husband, Justin, to get my jacket measurements in advance! I will cherish this wonderful gift forever! Thanks Dan! Rickie Fowler and me...I joked with him most of the day that he was wearing the wrong shade of orange! (I went to University Texas; he went to Oklahoma State) Each pro and celebrity graciously donated their time to be at this wonderful event accepting no appearance fees. I admired Rickie's dedication to be there, hence his busy PGA Tour schedule! Thanks Rickie! Even though you caused me to miss that birdie putt on the 5th hole! Rickie (playing in the group behind me) even to his surprise, somehow managed to drive the green with his 3-wood on the Par 4 #5, which rolled right thru my line as I was putting. We all had a good laugh! 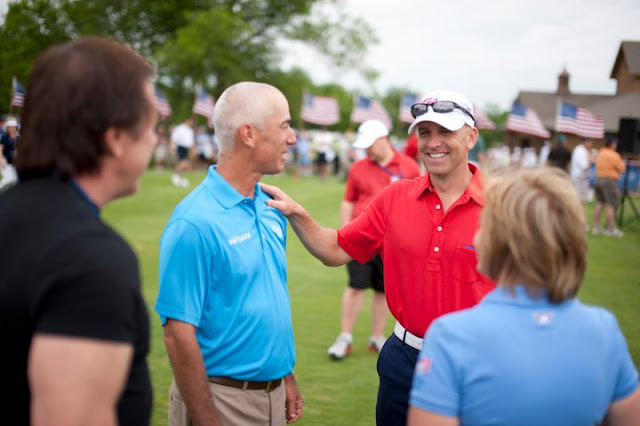 Corey Pavin was the second recipient of the Brock Bucklin Patriot Award. Justin...helping me pick out a target on the 4th hole. Justin and me with Major Ed! 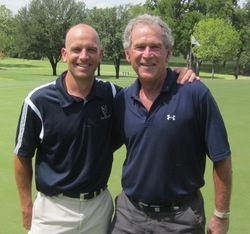 Major Dan Rooney with former President George W. Bush, first honorary recipient of the Brock Bucklin Patriot Award. On the 16th hole, greeting familiar faces and friends I had met a few years earlier with the Wounded Warrior Project. 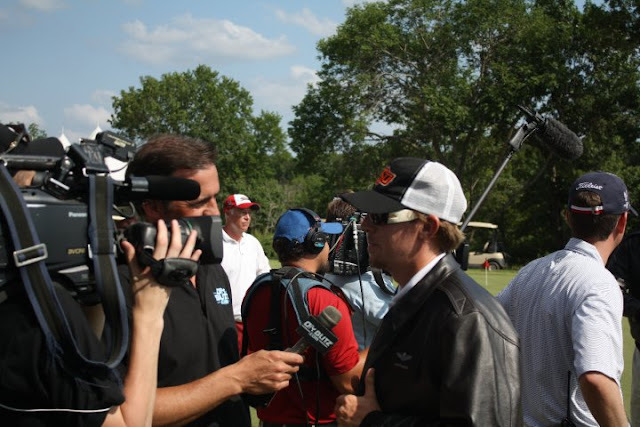 Hunter Mahan, wearing his fighter pilot jacket and interviewing with the Golf Channel. The entire day was aired as a special on the Golf Channel! 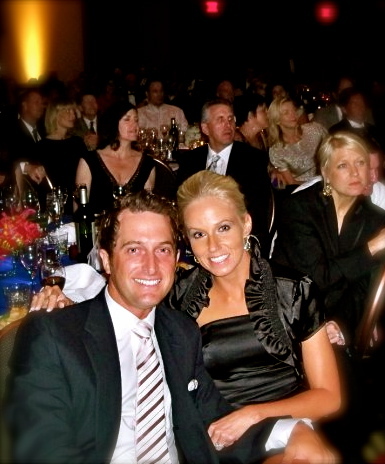 Rich Lerner, from The Golf Channel, was the Master of Ceremonies at the Black Tie Gala that night. 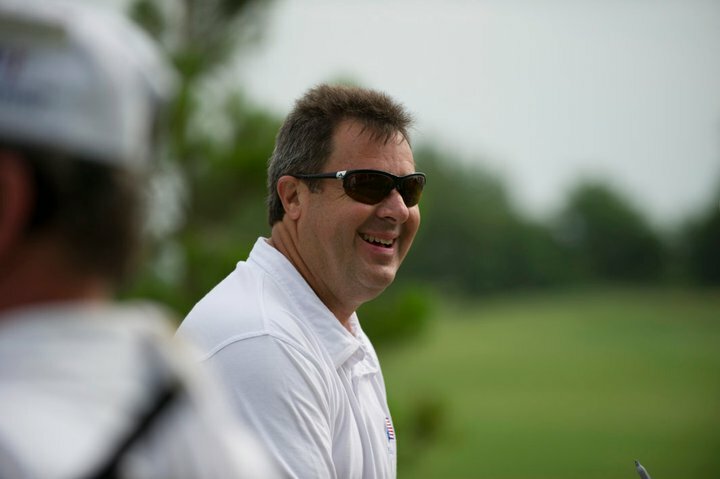 Joe Sterenka, CEO of the PGA of America, partner to the Folds of Honor. Country Music Hall of Famer, Vince Gil donated his night to perform many of his country hits! 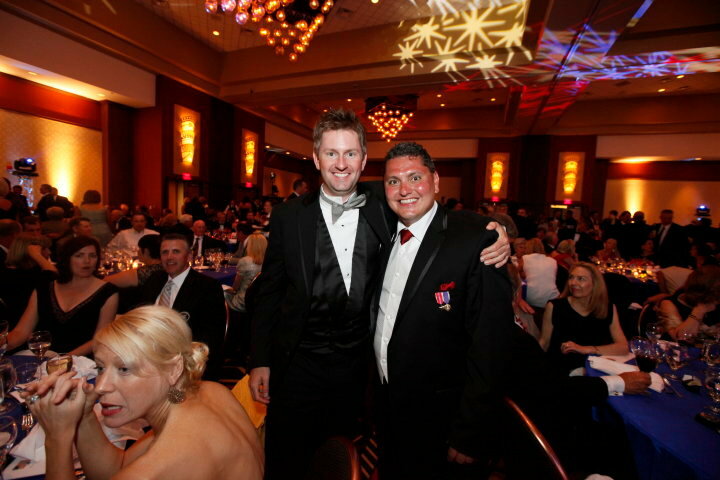 Our wonderful friends, Ryan Munson and Major Ed, at the Black Tie Gala hosted by the Hard Rock Resort and Casino! The Hard Rock Resort was so wonderfully generous to sponsor and host the Black Tie Gala later that evening for over 800 people! The entire room was moved to tears with testimonies from families who had lost a parent at war or loved one serving our country! Just wanted to share this picture from a few years ago! Josh Kelley, me, and Charlie Rymer took a day off from filming Golf Chanel's "Road Trip Myrtle Beach" to play in the Hootie and the Blowfish Monday After the Masters Celerity Pro-am. Here we are with friends from the Wounded Warrior Project! 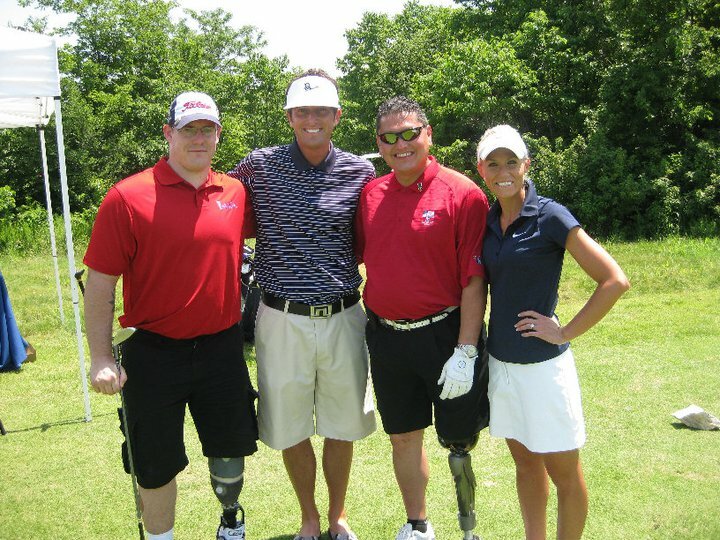 We played with two amazing war veterans who had lost both legs in a roadside car bombing while serving in Irag. I will be forever grateful for the privilege to have been honored to meet them and to have played golf with them. As we walked down the fairway, they each shared their detailed personal stories with me. This day changed my outlook on life forever! Please visit www.foldsofhonor.com and make sure to get out and play golf this Labor Day Weekend! 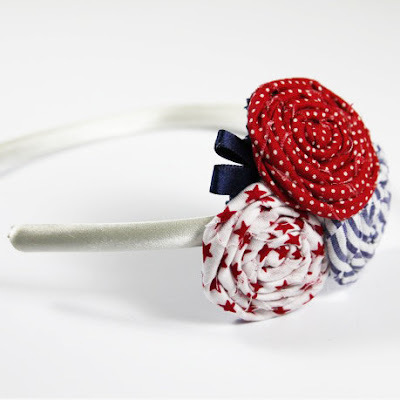 In honor of Patriot Golf Day this weekend, Perfectly Perrywinkle is donating 100% of the proceeds from the purchase of the "Stars and Stripes" headband to the Folds of Honor Foundation. Thank you so much for you support!